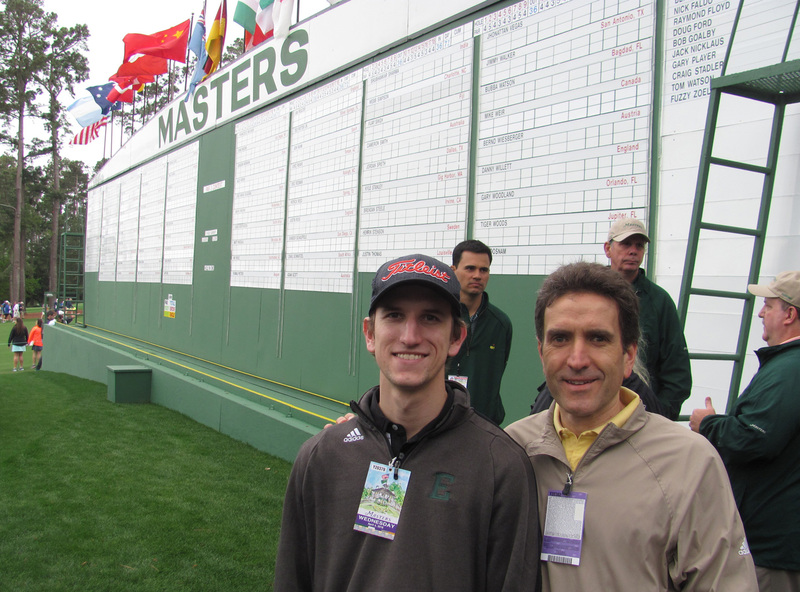 Back in 2012, my dad asked me to apply for tickets to The Masters. He had been applying for a few years and wasn’t having any luck getting tickets through their annual lottery. He figured that having me, my sister, my uncle, and a few others apply would increase his chances of getting to go back to the event, as he was lucky enough to have gone once before. We have completed the random selection process for Daily Tournament tickets and regret to inform you that your application was not selected for tickets. I’m certain that many of you are familiar with that message. Congratulations. The Masters Tournament is pleased to announce that our random selection process for 2018 Practice Rounds tickets has been completed and your application for tickets has been selected. My immediate reaction was what do I do now? To which my Dad replied, BUY THE TICKETS!!! Needless to say, the tickets were purchased, and the planning began. It was a long wait from the time I received the email on June 20, 2017 to attending the practice round on April 4, 2018. 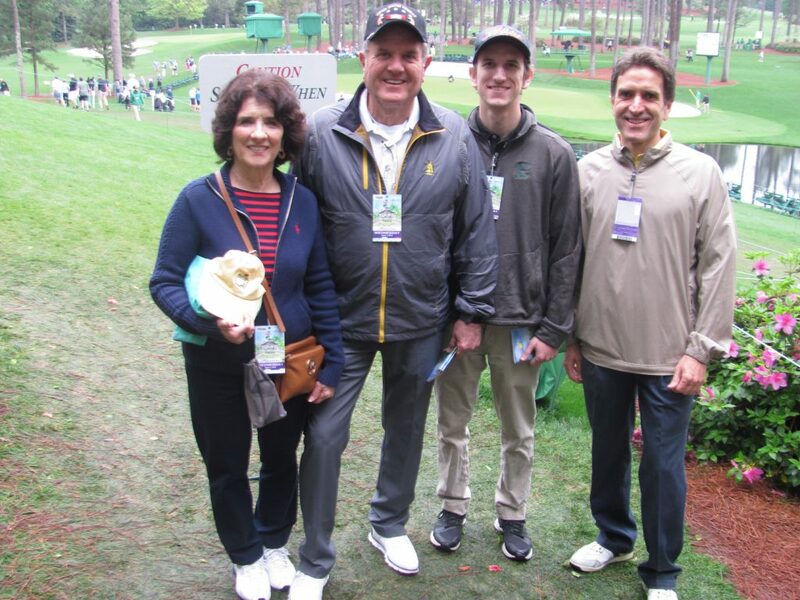 If Jim Nantz calls the tournament “A tradition like no other,” then attending The Masters is an experience like no other. It is difficult to convey how impressive everything in and around the event is in words and pictures, but I’m going to give it a try in the rest of this post. My parents had been there before and told me how awesome the experience is. For a golfer, it is truly incredible. Even for a non-golfer, it is a sight to behold. The beauty of the grounds and the atmosphere make for an unforgettable day. Bottom line, if you ever get the chance to attend the event, whether you golf or not, do it. You won’t regret it. 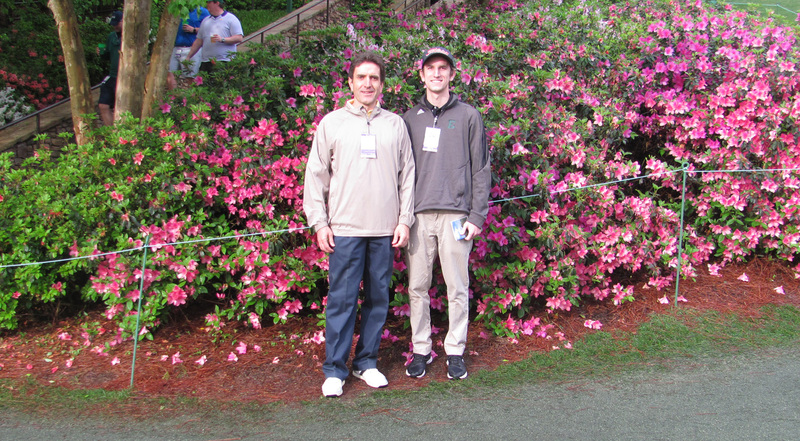 Before I dive into a display of the images I was able to capture while on the course, here are my observations as to what makes The Masters so special. 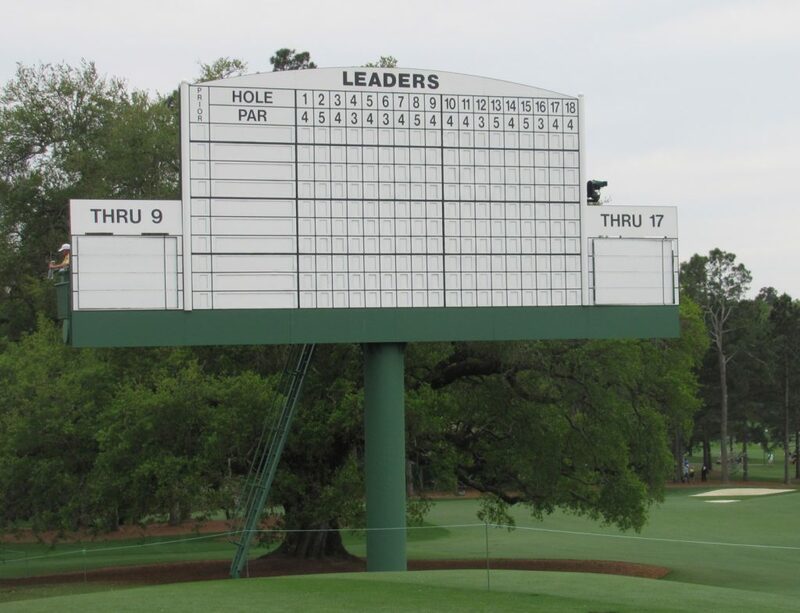 In a day and age where everything is commercialized and sponsors are omnipresent at every sporting event, they are conspicuously absent at The Masters. It’s truly amazing that they’ve been able to avoid the lure of the corporate dollar and have kept the golf course free of corporate logos and sponsor tents. 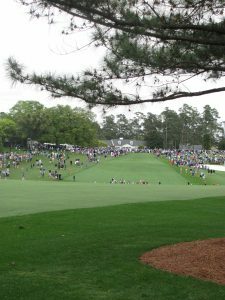 The layout of the golf course was built as much for spectators as it was to challenge the players. There are so many great vantage points where you can see multiple greens and fairways to follow the action of the tournament. In addition, the way it is laid out with the finishing holes at the top of the hill allows the roars from the holes in the hollow below to echo. It sent chills down my spine during the practice round. I can only imagine what it was like in 1986 when Nicklaus made the run at his last green jacket. I haven’t golfed at a ton on courses, but I’ve golfed at enough to emphatically state that Augusta National is, by far, the most well manicured course that I’ve ever seen. It’s immaculate, and they have thought of everything down to the color of the sandwich wrappers to keep any stray trash from impacting the experience. The service and experience as a patron is unique. All of the staff go out of their way to make certain that you are having a one of a kind, top notch experience that you will not be disappointed in. 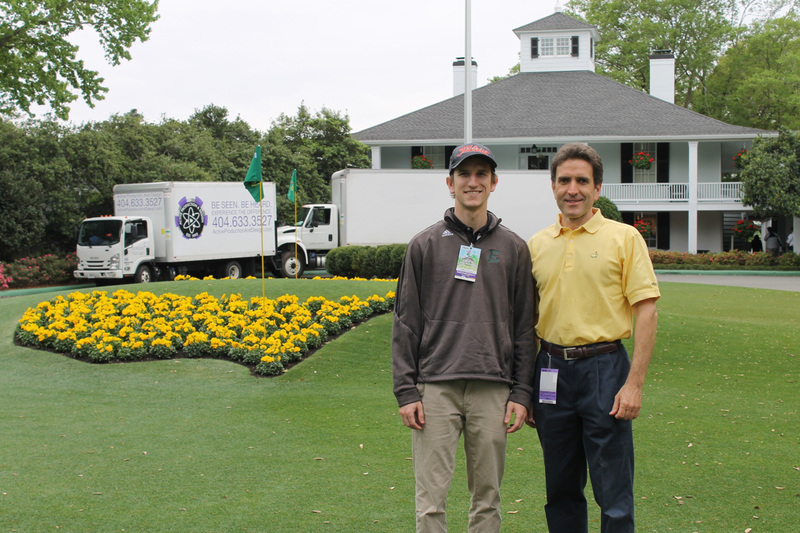 Every employee representing Augusta National was courteous, friendly, and respectful. It felt surreal, almost as if I was part of a Hollywood movie set. I’m not all saying it was contrived. It was simply amazing how uniform the service was. I can understand why players must absolutely adore this tournament. In addition to catering to the patrons, the tournament goes above and beyond when taking care of the players. The layout of walkways and practice areas provide privacy to players. There’s also a number of tee and green areas where patrons are not present which allows players privacy and a moment to collect their thoughts. The most evident is the area from No. 12 green to No. 13 green. 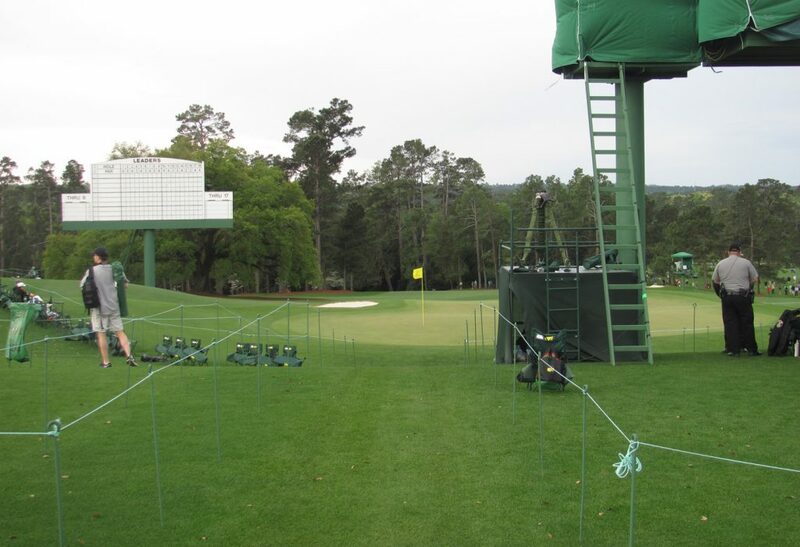 At this part of the course, the players are practically isolated. It’s great to see so many legends of the game, past and present. One of the things that makes The Masters unique is that it provides a lifetime exemption to past winners. While this may seem odd to allow older players to compete against the dominant golfers of the current generation, it provides for another unique experience. Getting to see legends like Jack Nicklaus, Gary Player and Tom Watson at the same time as seeing the current generation of players like Tiger Woods, Jordan Speith, Justin Thomas, Rory McIlroy, Rickie Fowler, and others makes the event that much more special. 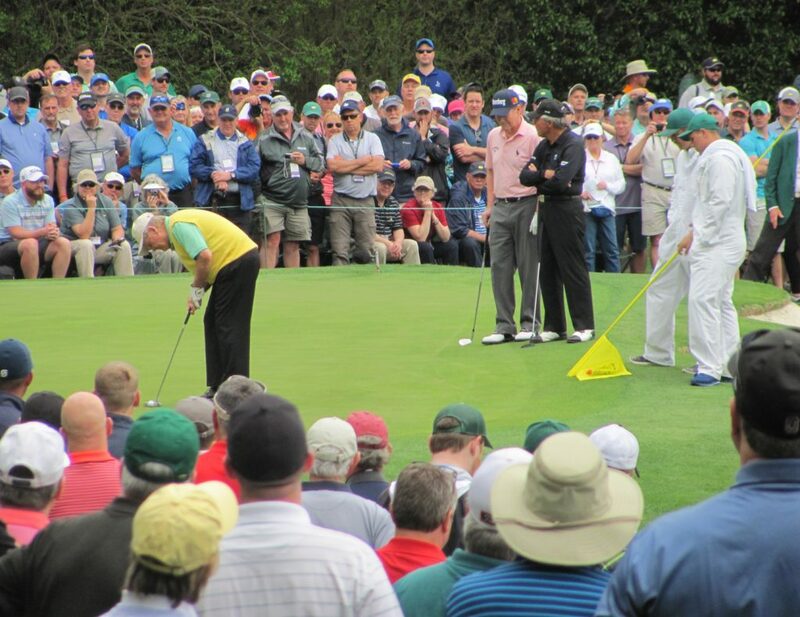 One thing you won’t see at The Masters is people in that all too familiar head down position, staring at the black hunk of glass and plastic in their hand. The tournament bans cellphones on the grounds. While it seems draconian, it is one of the best policies ever. It make for a true throwback experience. Instead of engaging in text messages, Facebook posts, and phone calls with people hundreds or thousands of miles away, people are engaged in watching the event. And get this, they are even forced to have conversations with people in the group they are with. And, believe it or not, people even engage with strangers. What a concept! With that said, here are a few of the other pictures I was able to gather throughout the day. I had to dig out one of my old digital cameras to take with me. It was odd not being able to use my cellphone, but as you’ll see, I managed. 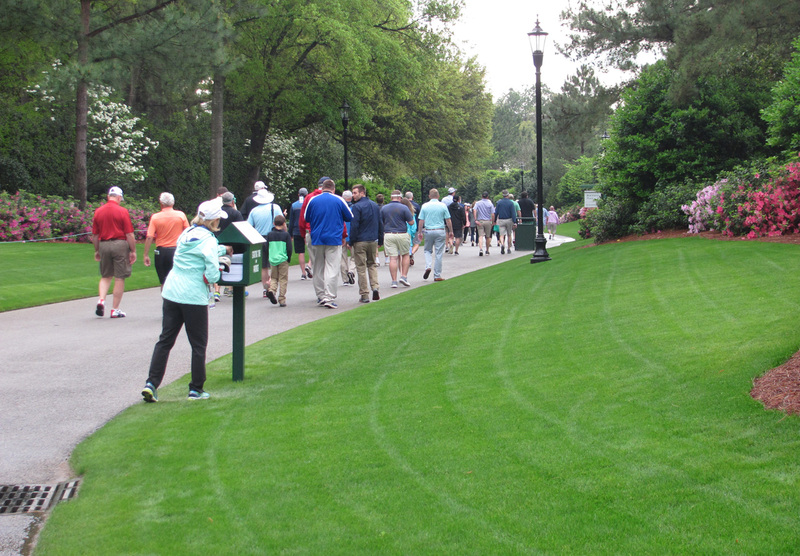 The azaleas were in bloom, and they are everywhere around the course. 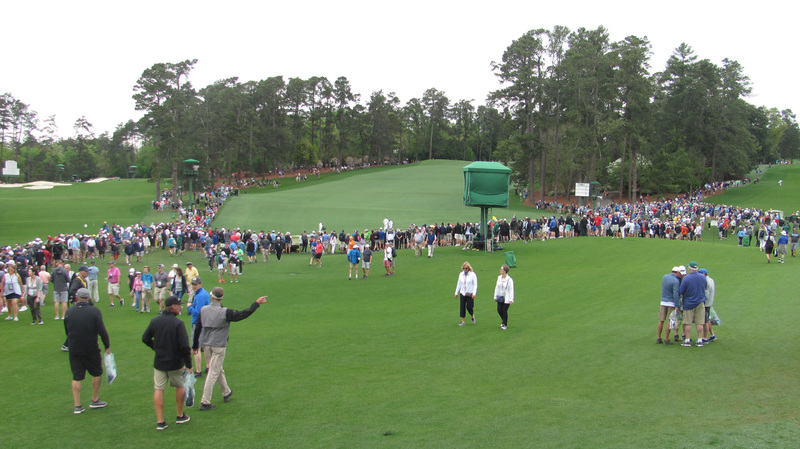 Just off the right side of the fairway, at the bottom of the hill on number one, is the iconic Masters scoreboard with the country flags of all the participants represented. In keeping with the low tech theme, notice that it’s not an electronic scoreboard. 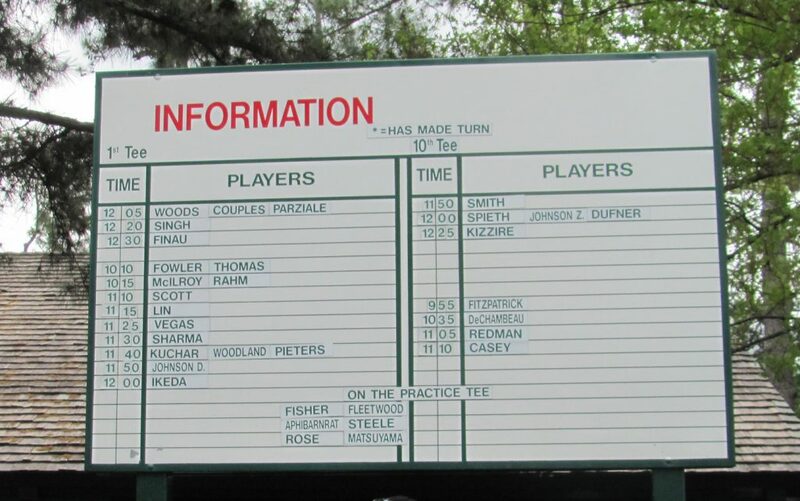 And speaking of scoreboards, they are everywhere around the course so both players and patrons can keep track of the action. In addition to scoreboards creating theater, you can see multiple holes from lots of places on the course. 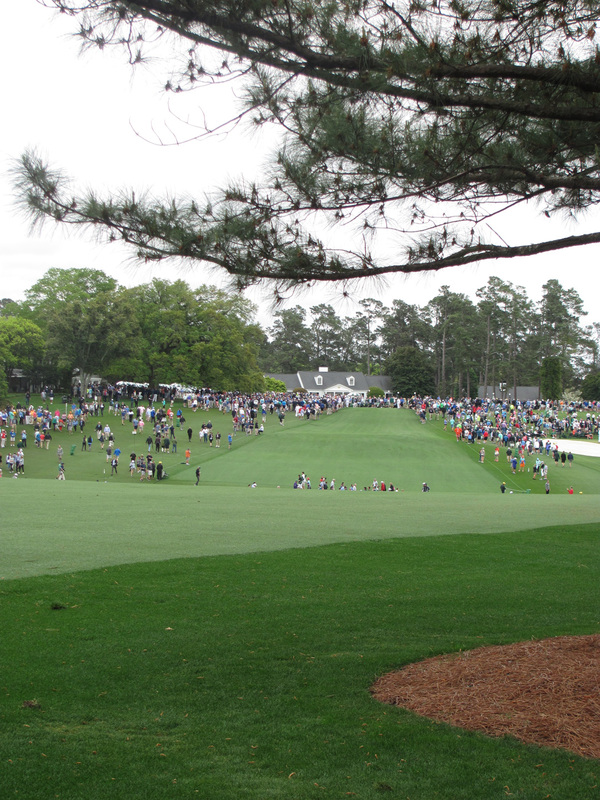 From this spot, you can see the greens of holes 2, 7, 9 and 18, and the tees of 3, 8. 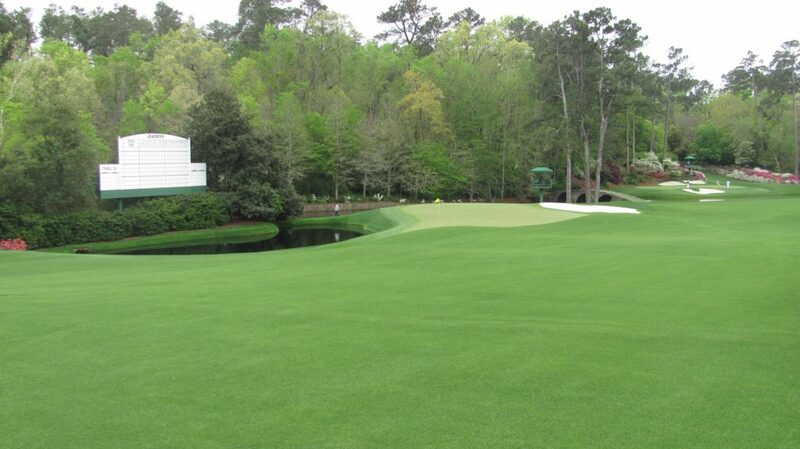 The second shot into number 11 is very, very intimidating. Television (and this picture) does not do justice to the challenging tee shot on number 18. On Wednesday morning, the area behind 18 is ordinary. On Sunday at 7PM, it’s special. 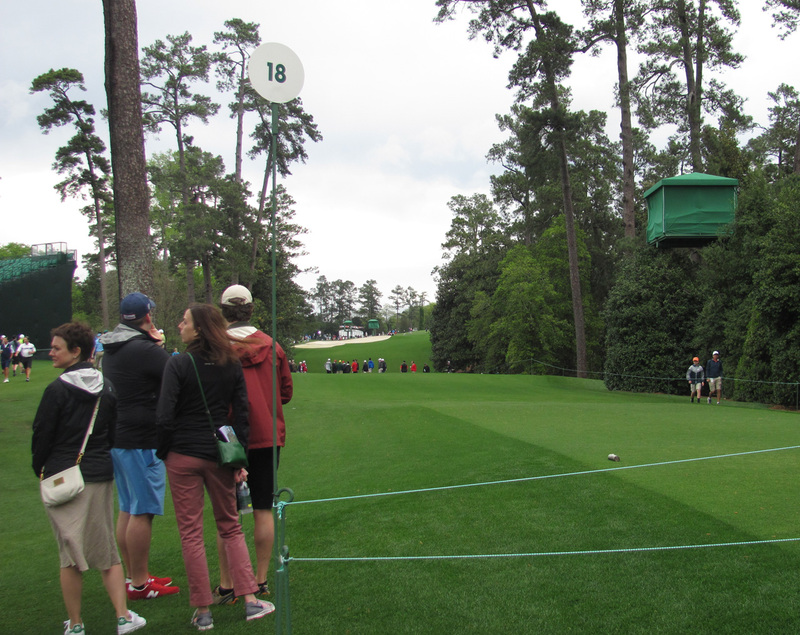 Just steps away from the 18th green is the famous Butler Cabin, where the green jacket is awarded to the winner. The practice round is the opportunity to see a unique pairing like Tiger and Freddie. 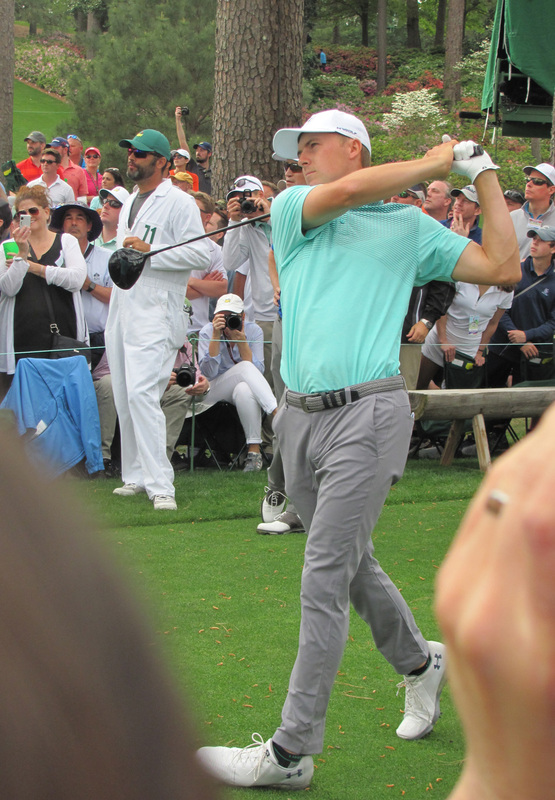 And to get a close-up of Jordan Speith launching one on number 17. 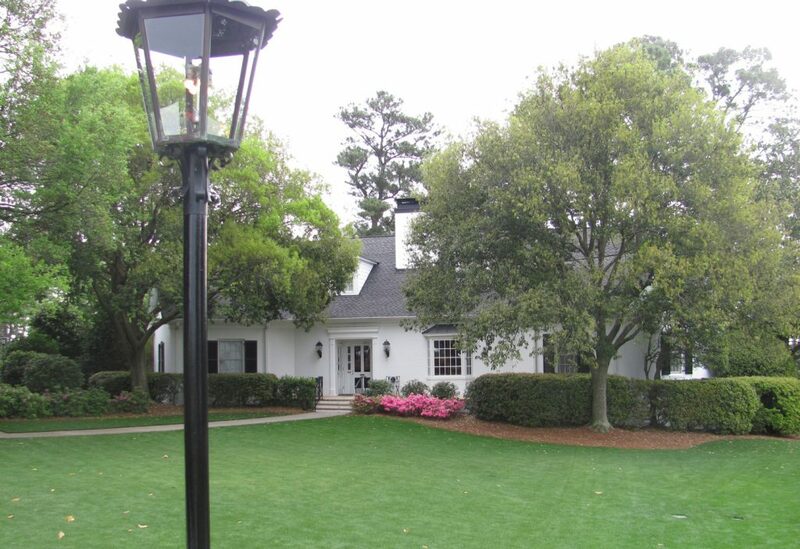 To help you follow your favorite players, The Masters does an excellent job posting pairings with their location on the course. With the lack of commercialization, you would think that food and beverage prices would be through the roof. I did not alter the image below, and the portions were standard size. In fact, the beer was a full 16 ounce pour for the prices listed. They even allow you to download an image taken by a professional photographer in front of the clubhouse for free. It was just a touch unfortunate that they were preparing for an event that evening and had the trucks in the background. 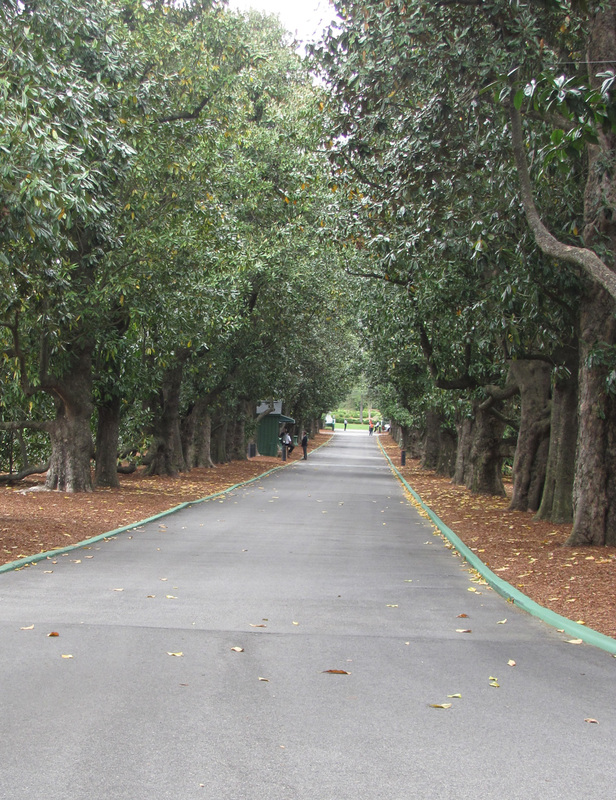 I’m going to wrap up with this look down Magnolia Lane leaving the clubhouse. All in all, it was a great day, and one I would hope to be able to experience again. This entry was posted in Life Journal on May 6, 2018 by Gregg Borodaty.